Maglev (derived frae magnetic levitation) is a method o propulsion that uises magnetic levitation tae propel vehicles wi magnets rather nor wi wheels, axles an bearins. 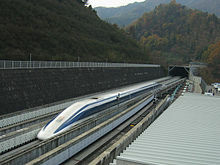 Wi maglev, a vehicle is levitatit a short distance away frae a guide way uisin magnets tae create baith lift an thrust. Heich-speed maglev trains promise dramatic improvements for human travel if widespread adoption occurs. ↑ "Magnetbahnforum | Barriers and Paradigms". Magnetbahnforum.de. Retrieved 2012-11-04.